Welcome to the last Blog Hop of the year...that sounds so funny saying that when it seems just like yesterday I was getting ready for last Christmas! 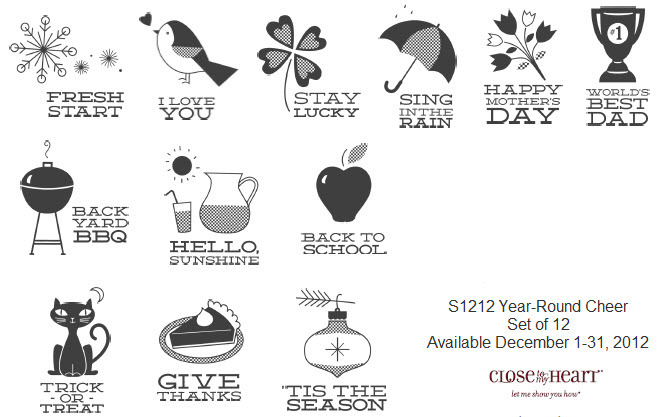 This month's Stamp Set, Year-Round Cheer, can be used all through the year! I guarantee you'll find tons of inspiration this month and I bet you'll find a calendar or two in the hop...that's how versatile this stamp set is! If you've come from Gina's Blog, you're on the right track....keep moving along! This is what the stamp set looks like...cute, huh! And here's what I've done with it...a 5x7 card mimicking the ever-so-popular chalkboard! Here are some closeups...the first of which is the work in progress! I laid out my Chalkboard Sheets and grabbed a stamp set (I ended up 'erasing' it though), White Daisy Ink (didn't use that either...lol) and my chalk marker. Grabbed some Houndstooth Irresistibles and started my layout! and then...arranged the ornament from the SOTM - stamped it twice then cut out the Cranberry version and pop-dotted it. I inked up the "J" and the "Y" with New England Ivy Ink and done! This was a SUPER FUN technique and of course there are different versions which I'll be trying soon! Did you know if you don't have a chalk marker, on BLACK CARDSTOCK (the chalkboard sheets bubble when heating - the bubbles go down but it sure does make you nervouse while you're doing it...lol) and you can use VersaMark and White Daisy Embossing Powder﻿ and to add even more depth, try stamping the same image using regular White Daisy Ink and create a shadow effect! Just remember to heat-set before you do anything so the ink won't smear...the Chalkboard Sheets are vinyl so the ink will rub right off! Thanks for stopping by! Don't forget to get your hands on all that retired stuff (paper and stamps) and for every $25 you spend in the month of December, I will give you $5 credit to purchase some NEW PRODUCT in February! Ok...enough of me! Your next stop is Susan's Blog...keep hopping 'till you get back around to where you started! There are quite a few stamp sets retiring BUT NEVER FEAR...that ALWAYS means that CTMH has some WONDERFUL NEW stamp sets to take their place! Here's a list - you can purchase directly from my website to ensure you get them before they're sold out - 'cause when they're gone, they're gone! Don't forget - for every $25 you spend, you'll get $5 credit to use on NEW product which comes out February 1st!!! With each new Idea Book (available in 2 short months), there must be a "Retiring List" of wonderful products that are available to you for purchase while supplies last! I'll be dividing the list up between several posts and will be starting with the PAPER and WORKSHOP ON THE GO (WOTG) Kits...AND for every $25 you spend, you get $5 credit to use on the NEW product that will come out February 1st!